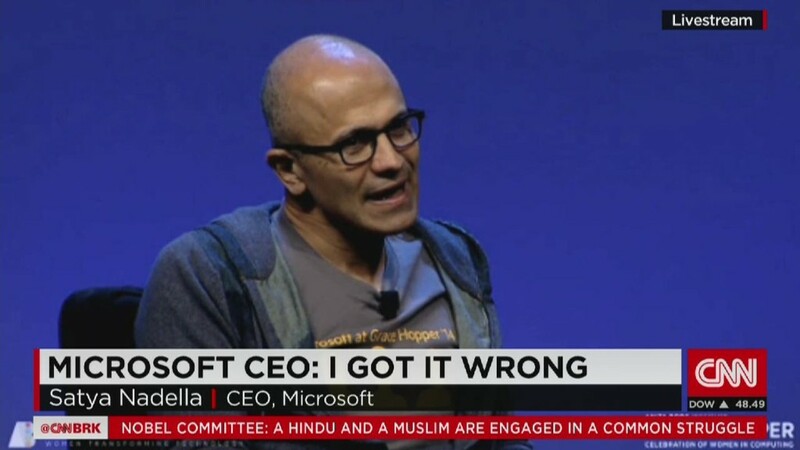 Microsoft CEO Satya Nadella has some really bad timing. 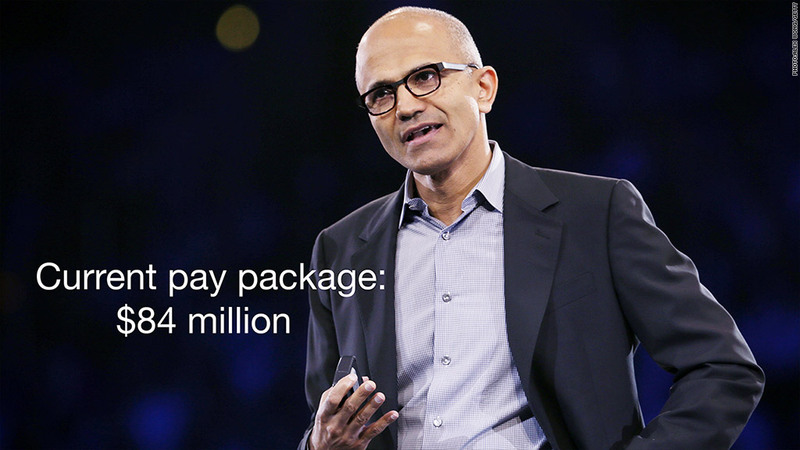 The very day that Nadella said women at Microsoft (MSFT) are paid equally for performing the same work as men, the CEO made headlines for his mammoth $84 million pay package. In an interview with USA Today on Monday, Nadella said that Microsoft pays women within a "tight band of 0.5%" variation for roles that are similarly performed by men. "I just asked our HR department to just go look at pay equity, right, just per similar, same level and same title, what is the compensation? And it turns out we don't have disparity," he said. Though Nadella says he feels "good about that," he acknowledged that Microsoft still has a long way to go before it can say it treats women and men equally. Women at Microsoft -- and at most other companies across many industries -- are not promoted as quickly as men, nor do they occupy as many senior leadership roles. Women make up just 29% of Microsoft's workforce but only 17% of the higher-paid tech positions. Just three of Microsoft's 15 senior leaders are women. Microsoft is the most male-dominant company of its Big Tech peers that have released demographic data about their employees. "Those are the things that we've got to go work on," Nadella said. Meanwhile, Microsoft announced late Monday that Nadella would bring home about $18 million a year in cash and stock, which will likely make him among the 15 top-paid CEOs in the world. It's part of a larger $84 million pay package that includes a large amount of stock options that will begin vesting in 2019. Nadella caught fire earlier this month for comments about how female employees shouldn't ask for raises because it would be "good karma" not to do so. He also said that "the system" will compensate women over time, and having patience for that pay to come was one of women's "superpowers." He later apologized, saying he was "completely wrong." Some of Nadella's competitors are headed by richly paid female tech CEOs. Oracle (ORCL) co-CEO Safra Catz is the highest paid CEO in the world, on pace to collect about $52 million in salary and stock options this year (the same as male co-CEO Mark Hurd). IBM's (IBM) Ginny Rommety earned $14 million last year, Yahoo's Marissa Mayer made $24.9 million, and Hewlett-Packard's Meg Whitman received $17.6 million in 2013. But their companies still have similar problems to Microsoft, with few women in highly paid positions. For instance, Yahoo has the highest number of men in senior leadership among its peers.